I’m happy (and rather relieved) to announce that after power-coding day and night for the past week, I’ve released a handy new device: the Deliverator. I’m sure you’ll find that it is the easiest and most convenient way to deliver a gift, notecard, or other item to a long list of your friends or customers! It’s available now at Cuddlefish Junction for L$500 (or L$4500 for a copyable version). What is this marvelous contraption? 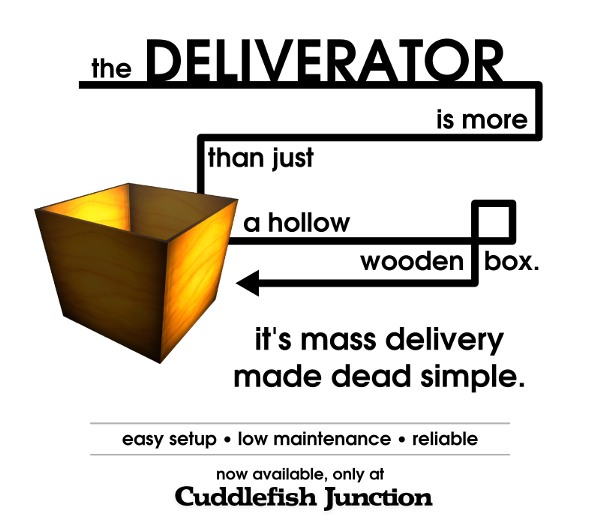 The Deliverator is a scripted object that will help you deliver an item to lots of people with very little fuss. Easy, guided set-up. Give it the item, give it the names, and off it goes. No keys required. Names are enough for the Deliverator to do its job. No need to look up everybody’s UUIDs or make them touch some silly prim. Low maintenance. Start it running and get on with your life. The Deliverator will IM you when it’s done, and let you know if there’s anything you should be aware of. Reliable. In the unlikely event that the Deliverator can’t find somebody on your list, it will remember their name and tell you at the end, so you can be sure no one gets left out. Unlimited delivery. The Deliverator can be used as many times as you want, and it can deliver to as many people as you can fit in a notecard. What’s to stop someone from spamming us with it? Me and my shut-off switch of cold steel justice, that’s what. If I have solid grounds to believe you’re using the Deliverator for nefarious purposes like spamming or harrassment, you may find your Deliverator suddenly stops Deliverating. See the “Abuse of the Service” section below for more about that. What can I deliver with this thing? Any inventory item that you can copy and transfer. Objects, notecards, clothes, whatever. Unfortunately, you cannot send multiple items at once, except by packaging them in a box or notecard and sending that. This is because of a quirk in the LSL function which prevents delivering multiple items to people in other sims. If/when Linden Lab ever addresses this issue, I can release a new version of the Deliverator to support multiple item transfer. Which perms should I get? The Deliverator is sold with your choice of either no-copy/transfer or copy/no-transfer object permissions. Both are identical except for the permissions. Most people will want to buy it as no-copy, because it’s more affordable that way! Plus it’s transferable, so you can let a friend borrow it, etc. The Deliverator is available for free or at a discount to educational institutions, help groups, charities, and other such “worthy causes”. To apply for a discount, send Jacek Antonelli a notecard named “Deliverator – [Your Organization Name]” with a brief description of your organization and its work. Running an excessively large number of Deliverators simultaneously for long durations (e.g. more than 20 for over an hour). This can negatively impact other people’s ability to use the service. Spamming one or more Residents with unsolicited and unwanted items. Any use that is deemed malicious, disrespectful to other Residents, or a violation of the Second Life Terms of Service and/or Community Standards. Depending on the type, severity, and frequency of the abuse, you may receive a warning, a temporary suspension of your access to the service, or a permanent revocation of your access to the service. Just don’t be a huge jerk, and you’ll be fine. a great device!! I hope sometime your device have a radar function for delivering notecards to all people in a Sim. Congrats Jacek! A really great tool, very useful for academic purposes. Thank you so much.